Come see why FEDT should play a key role in building your family's self defense toolbox! Defending yourself means so much more than just owning a firearm, but the path to being prepared for the unthinkable can be confusing, intimidating, and expensive. WE KNOW THAT first hand! ​That's why we work hard to help our students not only get started with their training, but also help them navigate the best resources and self defense options to make sure they get good information and understand how to make the most of their investment. You need more than a firearm and a piece of paper allowing you to carry it. ​You will get more when you train with us! The right ATTITUDE makes all the difference. The right SKILLS take a commitment to develop. The right PATH can be hard to find. 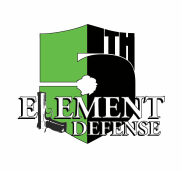 Why not let the professional instructors at Fifth Element Defense help? Each one is just 2 hours and only $25/person. Each week will focus on a different aspect of defensive shooting, with drills, tips, and feedback from our instructors. Please consider joining the NRA today - your membership dues help support the only group actively working to protect your Second Amendment rights. Did you know the NRA is so much more than a political group? Your dues and donations also help us fund the most widely trusted firearms education programs in the nation. Click the link to the right to be taken directly to the NRA member site. There you can sign up or renew for a DISCOUNTED RATE! Thank you for supporting YOUR NRA!